Striker Lukas Jutkiewicz is set for his first game time since recovering from a cruciate knee ligament injury tomorrow. The 27-year-old has been out since August when he became Burnley's fifth cruciate victim in 18 months at Bristol City, but is set to play 45 minutes for the Development Squad at Melwood against Liverpool. And if all goes to plan, he could step up his return behind closed doors at Gawthorpe against Port Vale on Tuesday. Clarets boss Sean Dyche revealed: "Juke will get a run out in a development game, obviously it will be a limited run out,as its early, getting a feel of it, but we're really pleased with that one. "It's unlikely he'll come into play this season, but we haven't put timescales on it, I've never liked to do that. "I had a few injuries, unfortunately. "But he's in a good place at the minute, and he's looking well, his fitness is good as he's had good time with the first team squad, getting up to speed with general training, before his build-up from the games programme." 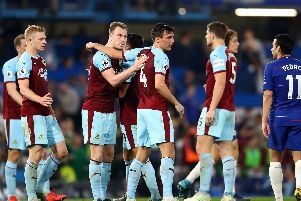 Dyche added: "He's been unfortunate, on the other hand, he's fortunate he's got good people around him who've been through that, not just the physios, but the players. "I think they've all knocked it down, the information, so I think that's been helpful. "Its a different view sometimes when you speak to another player, rather than the medics. "He's just been ever so unfortunate. His injury was the most unfortunate of all, his was the most bizarre. "There was no one near him, he was just backing off and then going to run forward, and how do you legislate for that one? "People ask 'is it because of the pitches, his boots? ', I don't know. That one was bizarre, and it was just the cruciate, normally you do something else as well, but it was just the cruciate. Everything else was perfect." Dyche's only other injury worry surrounds forward Chris Long, who has a hamstring issue: "Longy is back on the grass with the physios, it was a more serious one, but he's making good strides."